Israeli snipers have murdered over 260 civilians in cold blood and have maimed thousands throughout a year of protests at the fence that imprisons the Palestinians living in the Gaza strip. Since 2007, they have been subject to an inhumane collective punishment of military blockade as reprisal for their voting for Hamas. A UNHRC report has confirmed that Israeli troops "have intentionally shot children, they’ve intentionally shot people with disabilities, they’ve intentionally shot journalists, knowing them to be children, people with disabilities and journalists”. Ask your MSPs to endorse the report and to support the Scottish Government's call for an arms embargo on Israel. The following letter was handed in to the Scottish First Minister's residence, Bute House, on Saturday 30th March. Ask you MSPs to add their voice in support of these two urgent calls. When the UNHRC adopted the report a week ago, the UK Government refused to vote in favour. Minister Alistair Burt condemned the Human Rights Council for a “lack of balance”. Almost 200 demonstrators have been shot dead by Israeli snipers in the past twelve months, including 35 children and tens of thousands injured, thousands maimed by live fire. In 2014, the Scottish Government called for an arms embargo on the State of Israel and Minister Humza Yousaf condemned the “deep inhumanity” of the then-ongoing Israeli attack on Gaza. 2. welcome and promote the UNHRC Report and support its investigators' request that the information be forwarded to the International Criminal Court in the Hague. 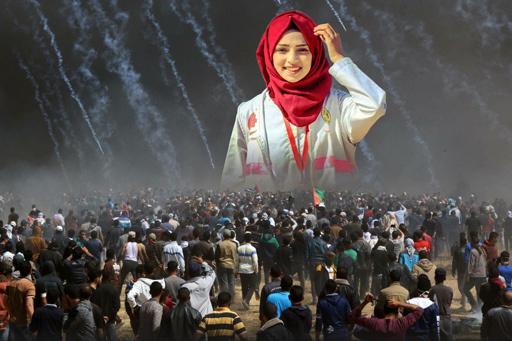 Razan Al Najarr, 21-year-old medic, murdered on June 1st 2018 by Israeli sniper while she attended to wounded protestors at the Great March of Return. Marc Regev subsequently shared video footage of an interview she had given in which she appears to admit that she was present as a human shield to protect Hamas military personnel. It was later proven when the complete video was shown that the Israelis had maliciously edited the footage to smear her reputation and minimise international condemnation of their racist subculture of normalised psychopathy.